Mucopolysaccharidosis type IIID is the least common of the four subtypes of Sanfilippo syndrome. It is caused by a deficiency of N-acetylglucosamine-6-sulphatase, which is one of the enzymes involved in the catabolism of heparan sulphate. We present the clinical, biochemical, and, for the first time, the molecular diagnosis of a patient with Sanfilippo D disease. The patient was found to be homozygous for a single base pair deletion (c1169delA), which will cause a frameshift and premature termination of the protein. Accurate carrier detection is now available for other members of this consanguineous family. Sanfilippo syndrome type D or mucopolysaccharidosis type IIID (MPS IIID) is an autosomal recessive lysosomal storage disease that is caused by a deficiency of the enzyme N-acetylglucosamine-6-sulphatase (G6S, EC 3.1.6.14). The enzyme is involved in the degradation of the glycosaminoglycan (GAG) heparan sulphate and the deficiency results in the accumulation of heparan sulphate inside lysosomes. MPS IIID is the rarest form of Sanfilippo syndrome and, to date, the clinical and biochemical features of only 12 patients have been reported.1–7 The clinical symptoms are very similar to those found in the other subtypes of Sanfilippo syndrome. There is an initial period of hyperactivity and aggressive behaviour, followed by a progressive deterioration in neurological function. There is only mild visceral and skeletal involvement. The G6S cDNA has been cloned and encodes a protein of 552 amino acids.8 The gene has been localised by in situ hybridisation to chromosome 12q14.9 Although the mutation has been described in the corresponding form of the disease in goats,10 no mutations have been reported in the human disorder. We present the biochemical and, for the first time, the molecular analysis of a patient with Sanfilippo syndrome type D.
The male patient is the third child of first cousin parents from Pakistan. He presented at clinic aged 3 years 10 months. He was born after an uneventful pregnancy with a birth weight of 3200 g. According to his parents, he had always been lively and although his cognitive development was quite well preserved, they were concerned about his lack of understanding at times. His hearing was reported to be normal and there were no problems with sleep or eating. On examination, his height and weight were just above the 50th centile for his age. He was very lively and examination was extremely difficult as he became very fractious. He had a hirsute facies and his facial features were quite coarse. He had a large head with frontal bossing, a low nasal bridge, and a tendency to hypertelorism. His nose was broad and flat. His tongue and hands were large. There was no hepatosplenomegaly and no audible murmurs. A mucopolysaccharidosis disorder was suspected and a skeletal survey was consistent with this diagnosis. Samples were collected and analysed further. The genomic DNA sequence for the G6S gene was obtained from a draft working sequence of chromosome 12 (NT_009616). Genomic DNA was obtained from a fibroblast cell line derived from the patient. Each of the 14 exons was amplified by PCR using intronic primers (table 1). A typical PCR reaction using 100 ng of genomic DNA contained 25 pmol of each primer, 1 × NH4 reaction buffer (Bioline), 0.2 mmol/l dNTPs, and 0.5 μl (2.5 units) BioPro DNA polymerase (Bioline) (added after a “hot start”). Details of the annealing temperature and MgCl2 concentrations used are provided in table 1. Cycling conditions were typically 96°C for 10 minutes, followed by 35 cycles of one minute at 96°C, one minute at 62-66°C, one minute at 72°C, and a final extension at 72°C for 10 minutes. PCR products were concentrated and separated from excess primers and dNTPs by ultrafiltration through Microcon-100 columns (Millipore) before sequencing. Products were sequenced in both the forward and reverse directions using BigDyeTM terminator technology (Applied Biosystems). Reactions were performed according to the manufacturer’s recommendations (Applied Biosystems) and samples were analysed on an ABI Prism 377 DNA sequencer (Applied Biosystems). The sequence change was confirmed by ACRS (amplification created restriction site) PCR using 5‘-GACATTGCTGGCTACGACCTAAATAAGACT-3‘ as the forward primer (underlined base is the mismatch) and SFD10(-) (table 1) as the reverse primer. The PCR products were then digested with the restriction enzyme TaqI. Urinary GAGs were measured on two separate occasions and found to be raised. 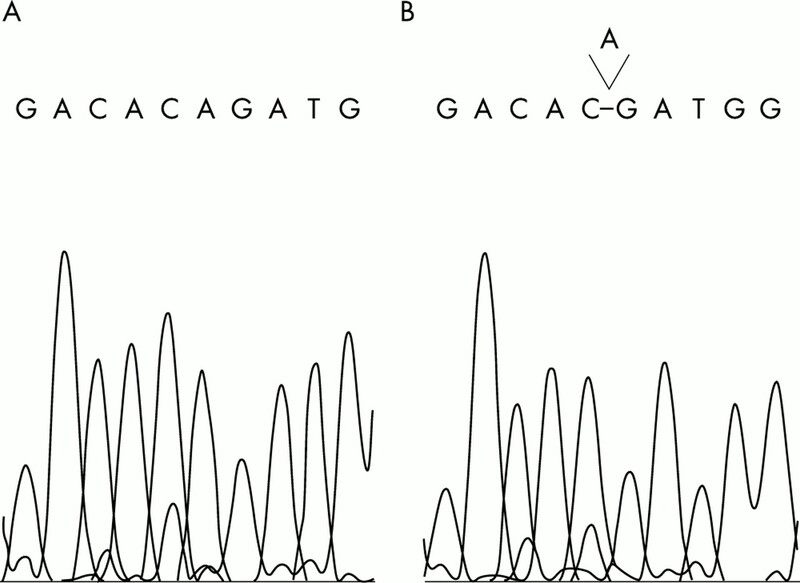 Two dimensional electrophoresis of the urinary GAGs showed an abnormal excretion of heparan sulphate and heparin-like component (data not shown). These results were consistent with the diagnosis of Sanfilippo syndrome. The enzymes defective in Sanfilippo disease types A, B, and C (heparan-N-sulphatase, α-N-acetylglucosaminidase, acetyl-CoA N-acetyl transferase, respectively) were assayed in either leucocytes or plasma. Normal activities were obtained for these enzymes (table 2), thus excluding a diagnosis of Sanfilippo types A, B, and C. A skin biopsy was obtained from the patient and N-acetylglucosamine-6-sulphatase (deficient in Sanfilippo type D) was assayed in cultured skin fibroblasts, using the method of He et al.15 As a positive control for Sanfilippo D deficiency was not available, fibroblasts from a patient with I cell disease, in which there is a deficiency of all lysosomal enzymes except β-glucosidase, were also assayed. No N-acetylglucosamine-6-sulphatase activity was detected in the fibroblasts from the patient (table 2) or the I cell patient, confirming a diagnosis of Sanfilippo syndrome type D in our patient. β-galactosidase, which was assayed as a control enzyme in cultured fibroblasts from our patient, was within the normal range. Even though the genomic sequence for the G6S gene had not been published, information detailing intron/exon boundaries was available in a draft working sequence of chromosome 12. The gene consists of 14 coding exons and is approximately 43 kb in length. All the exons and flanking regions of the gene from the patient and a control were amplified and sequenced. A deletion of one nucleotide (adenine residue) was found in exon 10 of the G6S gene from the patient, c1169delA (fig 1). The deletion is predicted to cause a frameshift after codon 389 and premature termination 10 amino acids downstream. The patient is homozygous for the change and material was available from both of the consanguineous parents. Confirmation of the deletion was carried out using ACRS PCR. The introduction of a specific mismatch and the presence of the deletion in the mutant allele create a TaqI restriction enzyme site (TCGA). This site cannot be created in the normal allele. PCR products were amplified from the patient, his parents, and a normal control. The products were digested with TaqI and the homozygous deletion was confirmed in the patient. As expected, both parents were found to be carriers of the deletion (data not shown). Single base pair deletion found in exon 10 of the G6S gene from the Sanfilippo D patient in this study. (A) Normal. (B) Patient. In this paper, we report the clinical, biochemical, and molecular diagnosis of a case of the very rare disorder, Sanfilippo D syndrome. The deletion of one nucleotide in the G6S gene is the first reported mutation to our knowledge. Since it causes premature termination of the protein and loss of the last 163 C-terminal residues, it is likely to be disease causing. Also, the deletion causes disruption of the protein sequence two amino acids upstream of an aspartate, glycine motif conserved in G6S, and four arylsulphatases,16 and causes the loss of a highly homologous region towards the C-terminus of human sulphatase genes.17 No other sequence changes that alter the amino acid sequence were identified in the coding region and no changes were found at the intron/exon boundaries that could affect splicing of the G6S gene in this patient. Our results now permit the molecular analysis of Sanfilippo syndrome type D patients and carrier testing within affected families. It will be interesting to determine the mutations in the 12 patients reported world wide to see if Sanfilippo D shows the same genetic heterogeneity characteristic of Sanfilippo syndrome types A and B. Financial support was provided by The Society for Mucopolysaccharide Diseases with funds raised by the charity Jeans for Genes. Research at the Institute of Child Health and Great Ormond Street Hospital for Children NHS Trust benefits from research and development funding received from the NHS Executive. Gatti R, Borrone C, Durand P, De Virgilis S, Sanna G, Cao A, Von Figura K, Kresse H, Paschke E. Sanfilippo type D disease: clinical findings in two patients with a new variant of mucopolysaccharidosis III. Eur J Pediatr1982;138:168–71. Coppa GV, Giorgi PL, Felici L, Gabrielli O, Donti E, Bernasconi S, Kresse H, Paschke E, Mastropaolo C. Clinical heterogeneity in Sanfilippo disease (mucopolysaccharidosis III) type D: presentation of two new cases. Eur J Pediatr1983;140:130–3. Kaplan P, Wolfe LS. Sanfilippo syndrome type D. J Pediatr1987;110:267–71. Siciliano L, Fiumara A, Pavone L, Freeman C, Robertson D, Morris CP, Hopwood JJ, Di Natale P, Musumeci S, Horwitz AL. Sanfilippo syndrome type D in two adolescent sisters. J Med Genet1991;28:402–5. Del Canho H, Van Den Bergh FA, Duran M, Hennekam RC, Groniger AM, Poorthuis BJ. Type D Sanfilippo disease in an 8 year old boy; a rare cause of mental retardation. Ned Tijdschr Geneeskd1993;137:969–72. Ozand PT, Thompson JN, Gascon GG, Sarvepalli SB, Rahbeeni Z, Nester MJ, Brismar J. Sanfilippo type D presenting with acquired language disorder but without features of mucopolysaccharidosis. J Child Neurol1994;9:408–11. Jones MZ, Alroy J, Rutledge JC, Taylor JW, Alvord EC, Toone J, Applegarth D, Hopwood JJ, Skutelsky E, Ianelli C, Thorley-Lawson D, Mitchell-Herpolsheimer C, Arias A, Sharp P, Evans W, Sillence D, Cavanagh KT. Human mucopolysaccharidosis IIID: clinical, biochemical, morphological and immunohistochemical characteristics. J Neuropathol Exp Neurol1997;56:1158–67. Robertson DA, Freeman C, Nelson PV, Morris CP, Hopwood JJ. Human glucosamine-6-sulfatase cDNA reveals homology with steroid sulfatase. Biochem Biophys Res Commun1988;157:218–24. Robertson DA, Callen DF, Baker EG, Morris CP, Hopwood JJ. Chromosomal localization of the gene for human glucosamine-6-sulphatase to 12q14. Hum Genet1988;79:175–8. Cavanagh KT, Leipprandt JR, Jones MZ, Friderici, K. Molecular defect of caprine N-acetylglucosamine-6-sulphatase deficiency. A single base pair substitution creates a stop codon in the 5‘-region of the coding sequence. J Inherit Metab Dis1995;18:96.
de Jong JG, Wevers RA, Laarakkers C, Poorthuis BJ. Dimethylmethylene blue-based spectrophotometry of glycosaminoglycans in untreated urine: a rapid screening procedure for mucopolysaccharidoses. Clin Chem1989;35:1472–7. Whiteman P, Young E. The laboratory diagnosis of Sanfilippo disease. Clin Chim Acta1977;76:139–47. Marsh J, Fensom AH. 4-Methylumbelliferyl alpha-N-acetylglucosaminidase activity for diagnosis of Sanfilippo B disease. Clin Genet1985;27:258–62. Voznyi YV, Karpova EA, Dudukina TV, Tsvetkova IV, Boer AM, Hanse HC, van Diggelen OP. A fluorometric enzyme assay for the diagnosis of Sanfilippo disease C (MPS III C). J Inherit Metab Dis1993;16:465–72. He W, Voznyi YaV, Boer AM, Kleijer WJ, van Diggelen OP. A fluorometric enzyme assay for the diagnosis of Sanfilippo disease type D (MPS IIID). J Inherit Metab Dis1993;16:935–41. Robertson DA, Freeman C, Morris CP, Hopwood JJ. A cDNA clone for the human glucosamine-6-sulphatase reveals differences between arylsulphatases and non-arylsulphatases. Biochem J1992;288:539–44. Parenti G, Meroni G, Ballabio A. The sulfatase gene family. Curr Opin Genet Dev1997;7:386–91.